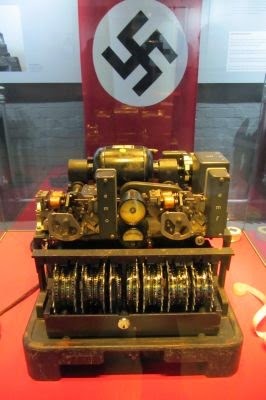 We had been to Bletchley Park some years before. As we had enjoyed that visit so much we went on a day coach trip as a wedding anniversary treat. My personal opinion is that it should now be called Botch-Up Park. Where on our previous visit there had seemed to be many collections, societies and re-enactment/living history groups now there were seemingly sterile buildings with far too much of the atmosphere gone. What I found incredulous was that the National Museum of Computing is not part of the Trust so that visitors need to leave the Trust property through the entrance and walk to the Museum which is at the opposite end of the Trust's boundary. When we visited last time, when we saw the computers ~ as far as we can remember ~ they had been part of the overall site. In the Trust's favour, the map handed to visitors was extremely useful in finding our way around and gave suggestions as to what to see in a visitor's time available. Multimedia guides were also available. During the Second World War Bletchley Park was the home of the Government Code and Cypher School. 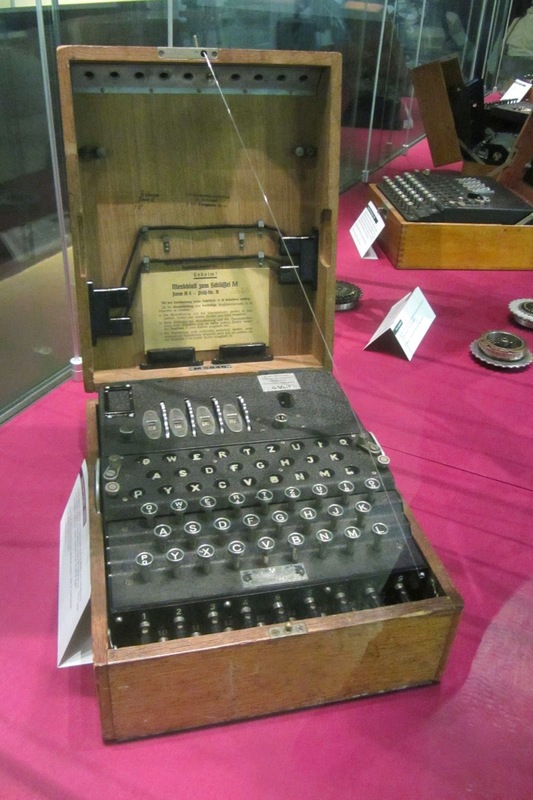 Here enemy codes were broken, eventually with the use of the Turing/Welchman Bombe and the Colossus, the world's first electronic computer. Much of what we saw was of more interest to Dave than to me but then much of what I wanted to see was of little interest to him. So we compromised. The first thing that caught my eye in the Visitor Centre was the poster for knitted socks. This was at the entrance into Introductory Exhibition. There was much to see and absorb in this exhibition, and I found it helpful to go back and look at it again at the end of our visit. From the Visitor Centre we visited the National Radio Centre ~ operated by the Radio Society of Great Britain ~ where Dave was in his element. In fact we visited the Radio Centre quite a few times on that day. As we wended our way round we found many of the buildings occupied but not open to visitors and a few other buildings marked on the map as open to visitors but were actually closed. To give Bletchley Park its due, it is undergoing restoration funded by the Heritage Lottery Fund. 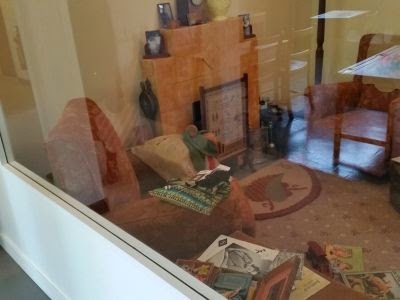 Following my interest in the Home Front I was content to come across a reconstruction of a bedroom in which a female operator who lived in digs would have slept. The blankets folded over the back of the green wicker chair are knitted. 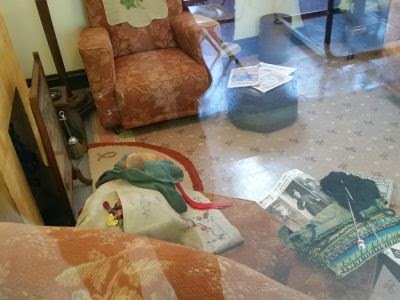 And the reconstruction of a living room, complete with knitting and knitting patterns. 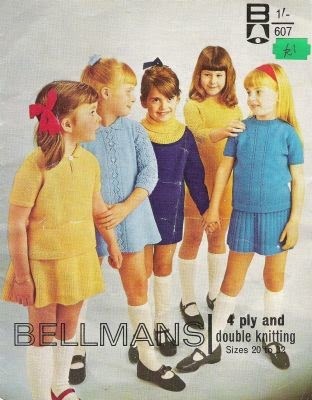 The knitting pattern shown in the top of the following two pictures is Bestway 877 for Sailor, Soldier and Airman Dolls. The embroidery is a just about my level ~ lazy daisy stitches. See also the socks, the rag or latch hook rug and other haberdashery items. Apologies for the reflections from the glass. These two rooms were along a wall of a space set out as a classroom. The desks took me back to my primary school days. I spent quite some time in this area while Dave spent some time in the "business" part of the exhibitions in this block. For what is where at Bletchley Park see the What to See section of their website. After more exploring and after lunch we started to make our way to the Mansion. The Garage had some impressive vehicles and there was also an exhibition by the Leighton Buzzard Model Boat Club. 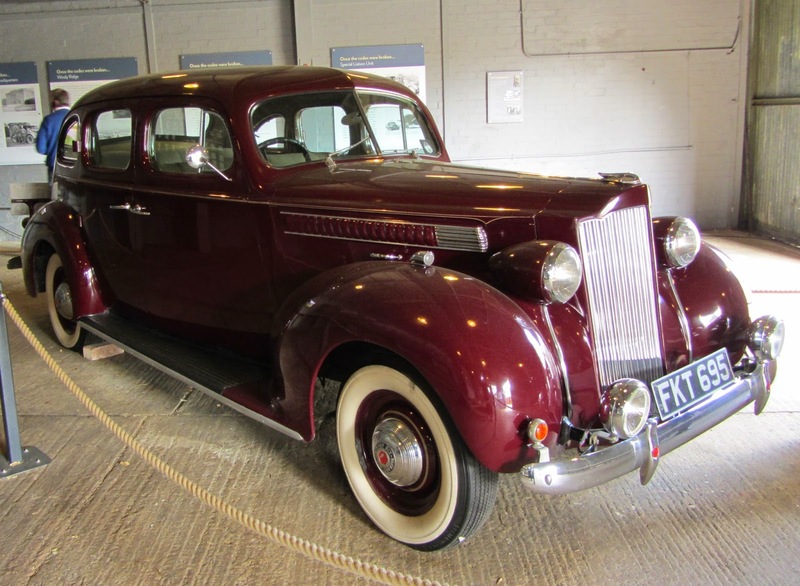 1940 Pickard Six cylinder Touring Sedan. 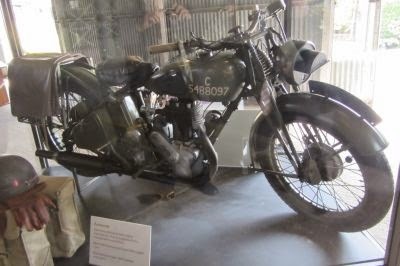 1943 Norton WD16H. 500cc single cylinder. 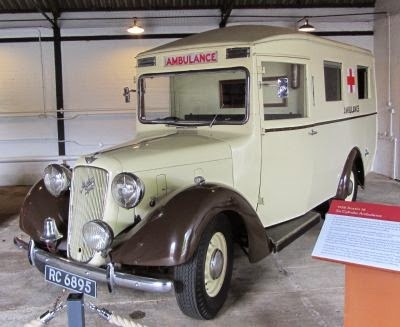 1938 Austin 18 Ambulance. Six cylinders. The Mansion was not as we remembered it. There were some furnished rooms and the library but the Churchill exhibition had gone. With the chairs set out as they were, the inside of the building looked like a conference centre rather than reflecting the important building that it is. I asked one of the staff in the Mansion shop if she knew what had happened to the Churchill collection and she said that only that day she had heard that it was going to the Stratford Armouries. See the Stratford Armouries Facebook Page entry dated 9th June 2014. Tucked away behind the Mansion are two gems. The first is the Bletchley Park Post Office which sells first day covers and will send them all over the world. The second is the Holley-Cornelius Toy Collection. 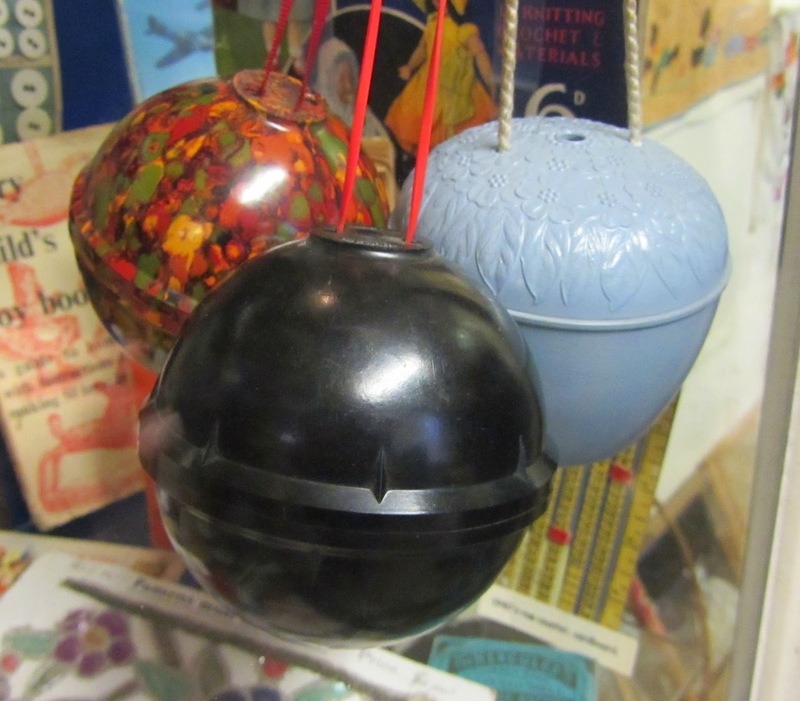 This is a small space jam packed with not only toys but also bygone household items including knitting tools, patterns and beautifully knitted garments. All the time visitors could be heard saying phrases like: "I/We had one of those", "I remember them", "I've not seem one of those for years". I bought a Bellmans pattern originally costing one shilling (5p). There were many yarncraft tools and haberdashery, some of which I recognised and some which I didn't. 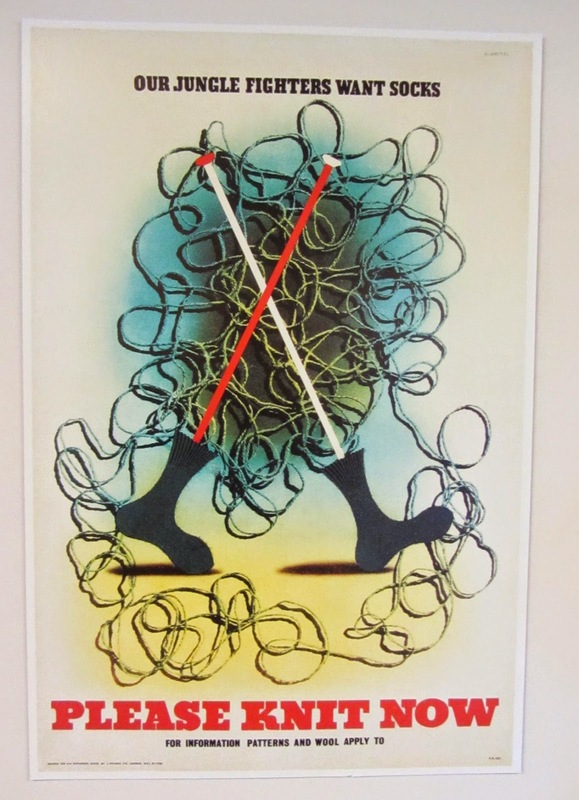 What I did see and know about were the wrist yarn holders. The ball goes into the holder with the working end coming out through the hole at the top and the holder is held on the wrist. I used to have one of these years ago and found it extremely useful. When I got home I donated a knitting pattern for a Coronation set to the Collection. 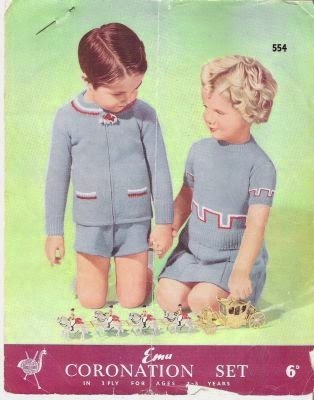 The pattern had been used so some lucky boy or girl got to wear one of these in 1953. In the early afternoon we visited the National Museum of Computing to see the the Colossus Gallery and the Tunny Gallery. We were fortunate to be with a group of students and we were allowed to stay to listen to the talk they were given. When we returned to Bletchley Park we retraced our steps to make sure that we had seen everything. There was time for sustenance before visiting the gift shop and returning home. There would be more pictures but the memory card from my camera has become lost. Sadly the Holley Cornelius Toy Collection is no longer at Bletchley Park. So sad as it brought back childhood memories to so many people. Thank you for visiting my blog today. Your comments are welcome. If you enjoy knitting please visit and Like my Facebook Page www.facebook.com/Paulineknit. Copyright Pauline Hornsby. Simple theme. Powered by Blogger.